Despite Dr. Slavin’s warnings to Irvington about its increasing anxiety and stress levels in 2015 and 2019, the Irvington community remains overtly inactive. “Now I’ll be talking about the statistics from the stress survey: 61% of students have shown modern to severe symptoms of depression, and 86% have shown moderate to severe symptoms of anxiety,” said Dr. Slavin. 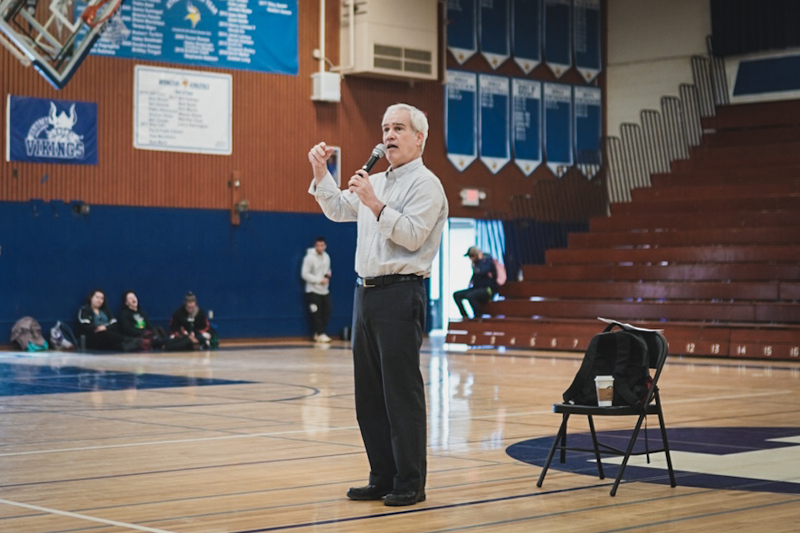 A couple gasps arose from the audience, but the majority of upperclassmen nodded as if Dr. Slavin was confirming something they knew already: Irvington’s not-so secret elevated stress levels. The numbers should have been alarmingly high to ordinary high school students, but most of Irvington sat unfazed. Why? For one, most Irvington students have accepted this pressure as the normal side effect of attending school in the Bay Area. As a result, though Dr. Slavin ended his speech on an optimistic note, students did not respond with the same enthusiasm. Many questioned the validity of the survey and scoffed at his advice to “change their mindsets.” Not a single student asked how to solve the problem, as Irvington numbly accepted the facts and moved on. Although Dr. Slavin released the survey in 2015 and 2019 with the intentions of highlighting the heightened levels of pressure placed on Irvington students, neither administration, teachers, nor students have discussed possible steps towards alleviating the statistically-proven stress. Teachers who have worked at Irvington for more than two years cannot feign shock at the statistics either, as the fierce competition is ever-present in the Irvington community. However, very few have taken Dr. Slavin’s surveys from 2015 and 2019 into account, as these same teachers maintain such rigor, even when it is blatantly unnecessary by state and AP standards. Of course, there are exceptions, such as CP teachers who have cut down on homework assignments and Ms. Miller’s de-stress advisory with meditation and face masks, but such cases are rare. Why intentionally make class test questions much more difficult than the official AP test? It is always better to over prepare, but some teachers still do not recognize the fine line between challenges and breaking points. The common advice against such classes is to just drop out when you get such a teacher, but that option is irresponsible and currently void. Teachers are encouraged to modify curriculums based on previous year’s performances, but consistency is nonexistent at Irvington. Teachers have made drastic changes to their syllabus that have surprised students at the beginning of the school year, at which point the student cannot drop out due to overpacked classes. If the students insist and talk to their counselors or the administration, they have the option to drop all their AP classes, at which point the student is left at a chokehold. Are they to stay in the class that causes pain and an inevitable failing grade, or do they to abandon the other classes that offer healthy challenges? When a choice of this magnitude is posed to a growing adolescent, this in and of itself aggravates symptoms of generalized anxiety. Dr. Slavin’s sentiments were similar as this mindset—enforced by teachers, administration, parents, and the students themselves—leaves no margin for error. This infamously monikered “zero-tolerance” policy is clear evidence that Irvington has not made the supposed improvements that were promised as a result of Dr. Slavin’s 2015 survey. Sadly, stress and anxiety levels have gone up seven percent and six percent, respectively, negating her claim of “promising signs” and proving that students are more stressed than ever. The fact that calls for help have decreased is worrisome, as it strongly hints that students would rather bottle up their fears rather than explain to their counselors. Now, more than ever, students need an outlet to express their worries, but such an outlet is nonexistent. Counselors are overburdened with more than 500 students each and a multitude of duties so they are not able to address the emotional well being of students. Unfortunately, students are not aware of professional help available on campus, as the school psychologist is seldom promoted to students as a resource. Yet, according to Dr. Slavin, the main source of stress is the pessimistic mindset of the students themselves. They are quick to claim that the results of the survey were over-exaggerated, but even if the numbers were slightly skewed, the overwhelming amount of stress at Irvington is undeniable. As a medical expert, Dr. Slavin used a survey that has been adjusted several times to provide the most accurate results possible. Rather than discussing how to bridge the gap between students and staff, students are questioning Dr. Slavin’s motives and credibility. Many mock the idea of a “growth mindset”; it is unrealistic to vanquish this toxic culture, but we should not cultivate it either. The Irvington community has ignored the survey results from 2015 and 2019, and mental health continues its downward trend. In lieu of expecting Dr. Slavin to fix our dire state, shouldn’t Irvington heed his advice and start a conversation about reforms before, as an Irvington teacher feared in 2016, the “ticking time bomb” that is Irvington explodes?